Native Instruments Komplet 11 - plug-in collection comes with a full suite of 45 virtual instruments and plug-in processors covering everything you need to create and produce professional-quality music in any genre. This comprehensive collection spans an impressive 13,000 sounds and 155GB of content, including synths, drums, pianos, cinematic instruments, and more. Many of us here at Sweetwater, from the Sales Engineers to the studio staff, rely on these same products for our own projects, and we consider them among the definitive industry standards. Once you get your hands on the instruments, effects, and mastering-grade processors in Komplete 11, you'll never look back. 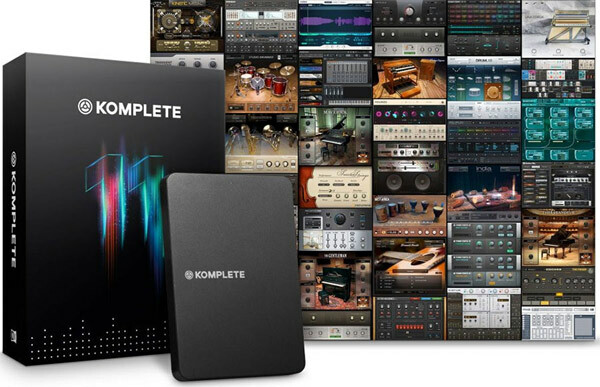 You'll find 45 instruments and processors and over 13,000 sounds in Native Instruments Komplete 11, totalling over 155GB of content. From the aggressive drum sounds and powerful sample editing of Drumlab to the lush and evolving pads of Absynth 5 or the intensely realistic piano sound of The Gentleman, Komplete 11 has you covered. Seven new titles add to the ever-growing Komplete 11 collection, including Native Instruments' breakthrough synth Form, which bridges the gap between sample playback and synthesis. And to top it off, you also get excellent mix tools from the Solid Mix Series, including studio-style EQ, Dynamics, and Bus Compression processors. If you're rocking a Kontrol S Series keyboard or Maschine hardware, then you'll be blown away by the way Komplete 11 fits into your workflow. Not only can you browse your Komplete 11 library for instruments right from your hardware, but you can also call up individual presets via the tag/category-based browser and tweak them to perfection without ever touching the mouse. It's the perfect combination of software flexibility with the hands-on control you'd expect from a traditional hardware keyboard or groove machine. Because Komplete 11 is such a powerful tool for songwriting, it's easy to forget it's perfect for post production too. If you produce audio for video on a regular basis, you know that you can never have too much content to pull from. And Komplete 11 really covers all angles - whether you need pulsing tribal drums for a car ad, a solemn acoustic piano for a short film, or powerful sound design capabilities to create sound effects, Komplete 11 has the tools you need. Best of all, the individual products are all very easy to browse through, making your entire creative process, from writing to mastering, totally streamlined.